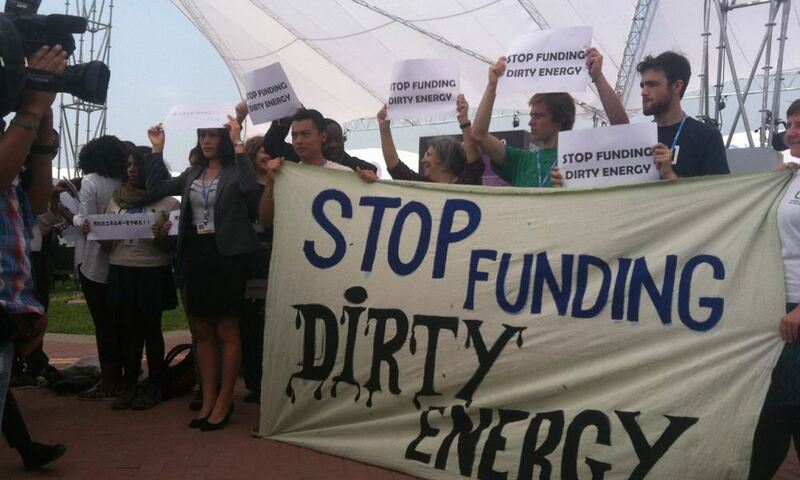 The fossil fuel industry has created a bit of a scandal for itself here at the UN Climate Talks in Lima. For the last week, a group called the International Emissions Trading Association (IETA) has been passing around a booklet of side events they are hosting throughout the summit. Scheduled for Monday is an event hosted by the Global CCS (carbon capture and sequestration) Institute that features speakers from Shell and the World Coal Association. The title: "Why Divest from Fossil Fuels When a Future with Low Emission Fossil Energy Use is Already a Reality?" If you were looking for evidence that the divestment movement is beginning to put serious pressure on the fossil fuel industry, look no further. The title couldn't be more hilariously convoluted. First, low emission fossil fuels are an oxymoron. Second, even if they did exist, they're certainly not a reality today: carbon emissions are increasing each year and are directly tied to fossil fuel use. With this one, even the industry lobbyists realized they'd gone a bit too far. Sometime this week, the event planners quietly changed the name of the panel too: "How can we reconcile climate targets with energy demand growth?" (They didn't however change the URL of the event, which still keeps the old title alive and well). Civil society groups are rightfully outraged that such an event is allowed to take place at the climate talks. They are hosting a protest on Monday morning, just before the panel, to shine a spotlight on the fossil fuel industry's terrible history in Latin America and call for industry lobbyists to be banned from the talks. While the World Health Organization, has banned tobacco industry lobbyists from taking part in tobacco control talks, the climate process has no such protections. Whatever name the panel goes by, it's speaks to the growing influence of the divestment campaign. Divestment efforts have grown in leaps and bounds since the last year's negotiations in Warsaw. This September, the Rockefeller Brother's Fund announced they would be divesting from fossil fuels, dealing an iconic blow to Big Oil. Earlier in the year, Stanford University announced it would be divesting from coal and looking at the possibility of full divestment. Meanwhile, religious communities, including the World Council of Churches, are taking up divestment as a moral cause. According to a recent report, the combined assets of institutions committed to divestment has topped $50 billion. That is still a small fraction of the total funds invested in the fossil fuel industry. But the goal of the divestment campaign has never been to financially bankrupt the fossil fuel industry. The goal is to morally bankrupt them. That process of social stigmatization is well on its way. Tar sands companies in Canada are speaking out about the "difficult environment" they face in convincing the public to allow new pipelines. In Australia, the coal industry is lashing out at divestment activists for (rightfully) dragging the industry's name through the dirt. A giant power company in the United States just committed to reduce its GHG emissions by 90% and cited the next generation of eco-conscious consumers as a key motivation. In Germany, the mega utility E.On is divesting itself from fossil fuels and focusing on renewables. The erosion of the industry's social license has begun to help open up the space for politicians to take action. France just made an important move to cut financing for coal fired power plants. Germany is going after coal to meet their emissions targets. Perhaps President Obama will even finally go ahead and reject the Keystone XL pipeline once and for all? Meanwhile, inside the UN climate talks in Lima, the rhetoric about the need to get off fossil fuels has never been stronger. Negotiators and civil society representatives are speaking about the potential for 100% renewable energy. On Wednesday, developing countries endorsed the goal of bringing greenhouse gas emissions to zero. UN Climate Secretary Christiana Figueres is openly talking about the need to completely phase out emissions. The case for going fossil free has been strengthened by the growing understanding of the carbon bubble. The idea of the bubble is easy to grasp. Fossil fuel companies are valued in large part on their ability to being their reserves of coal, oil or gas to makers. But in order to limit global warming to below 2°C, the target the world has agreed to meet, roughly 80% of those reserves must be left underground. That wipes potentially trillions of dollars of the industry's balance sheet. As this inconvenient truth begins to settle in, investors are becoming increasingly nervous. Earlier this week, the Bank of England announced it would be looking seriously at the threat of stranded assets. When major institutions like that start questioning the future of fossil fuels, you know a sea change is underway. With the world turning against them, the fossil fuel industry is grasping at straws, namely the massive deployment of carbon capture and sequestration (CCS) technology. Talk about living on a prayer--and in this case the industry is far from halfway there. CCS has never been demonstrated at scale and the test projects underway are riddled with difficulties. Even if the technology was viable, it would be massively expensive, undercutting the industry's ability to compete with renewable energy. The climate movement will have to remain vigilant in protecting the various pieces of the climate process from being corrupted by "false solutions" like CCS, but this is a fight that we're well equipped for. Monday's panel here at the climate talks will be met with protests and a social media barrage designed to get out the real facts on CCS. Fossil fuel divestment has helped put the industry on the defensive. Time for negotiators to start playing offense.